General Glassblowing Resources Page which covers books, organizations, tool suppliers, glass suppliers, descriptions of laborator glassware, and art glass links. Enter a number, select what it represents and click Calculate. The answer will appear here. If you need them, we also have some unit conversion calculators for distance and volume. Glassblowers sometimes need to calculate the volume of a cylinder of a given length or diamter. This handy chart lists the height and ID required to give a volume of 1 mL. For example, by looking at the chart we can see that a cylinder of ID 42 mm has volume of 1 mL for every 0.72 mm of height. The relationship between the height, radius/diameter and volume of a cylinder is given by V=hπr2 where V is the volume, h is the height, r is the radius (half the inner diameter) and π = 3.1415…. In the JavaScipt calculator below, you can enter any two of the three variables and it will determine the value of the third one for you. Enter any two of the three variables and then hit the Calculate button next to the value you wish to determine. 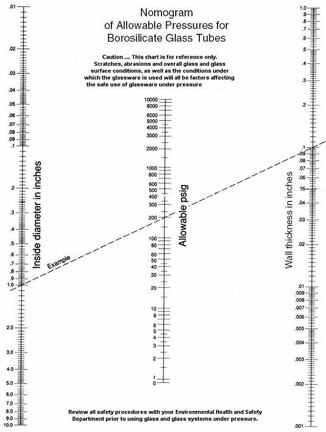 Glassblowers routinely use calipers to measure glassware, and some of these even read in both inches and millimeters. However, most calipers do not handle fractional measurements such as 11/16". This table is list of fractional measurements along with their decimal and millimeter equivalents that you may want to print and hang by your workbench. This table is great for woodworkers,too! Glass can be used under vacuum or pressure, but the larger the pressure differential, the thicker the glass must be. Even so, every time the glassware is used under pressure differentials of more than one atmosphere (760 torr) it must be thoroughly inspected for defects, star cracks and other potential points of failure before pressurization. Safety shields and other forms of protection are also necessary. The information in this section should be used as a source of comparative figures only, representing a broad range of glasses within their respective family groups. For specific technical data each glass should be identified as to manufacturer and glass code number. On occasion, a glassblower may be asked to construct a piece made of glass and some other material. For example, a conductivity cell might need an electrode embedded in the glass or a glass high vacuum manifold may need to mate to a metal thermocouple. Making such connections directly is nearly impossible because the two materials have to have very similar thermal coefficients of expansion and other properties. By using a graded seal like the one shown to the right, one can join extremely short lengths of glass that vary from each other by just a little bit and achieve a smooth transition from one material to another. These will span the range between the borosilicate or quartz and the other material. These table below contains some of the most common combinations. Fritted glass is a porus filter made of glass fibers or granules. They are widely used in inorganic and organic laboratories and come in many different forms. 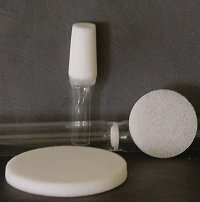 Fritted funnels are used for liquid/solid separation and purification. Fritted gas dispersion tubes are used to absorb/remove/dry gases, disperse gases in liquid solutions, and many other applications. They are typically found in disc or cylindrical form in borosilicate and quartz glass. You can learn more about glass fritted funnels and their care in the Glassware Gallery. Quartz Properties at Momentive Performance Materials Inc.
Technical information sheets at Kimble Chase (formerly Kimble-Kontes). Quartz properties and handling at Tosoh Quartz. Product information and specifications at Schott Glass. Propery Data Summaries for Oxide Glasses at NIST. Ceramic properties at Mindrum Precision. Simax (a division of Kavalierglass offers various types of tubing, capillary and rods. The American Vacuum Society has a chart of working pressures of vacuum gauges as well as a pressure conversion calculator. GE Quartz Calculators - Internal Stress, Transmission, Window Thickness at Momentive Performance Materials. Martindale's Reference Calculators, an extensive calculator database. Modern Vacuum Practice has a list of vacuum links with interesting and handy information such as pump choices, how a thermos works, and more. Technical and Safety Data for Compressed Gases at Scott. On our General Glassblowing Resources Page you will find books, organizations, tool suppliers, glass suppliers, descriptions of laborator glassware, and art glass links.